I was returning from Devils Lake today and much to my surprise I spotted a “Boat Inspection Ahead” sign on the shoulder of I-5 near the Aurora rest area. The signs encouraged travelers to prepare to pull off at the rest area for a voluntary invasive species inspection. I was not transporting my boat but being the curious type I pulled off to see what I could learn. Waiting for my arrival were two Oregon Department of Fish and Wildlife employees who were more than informative. 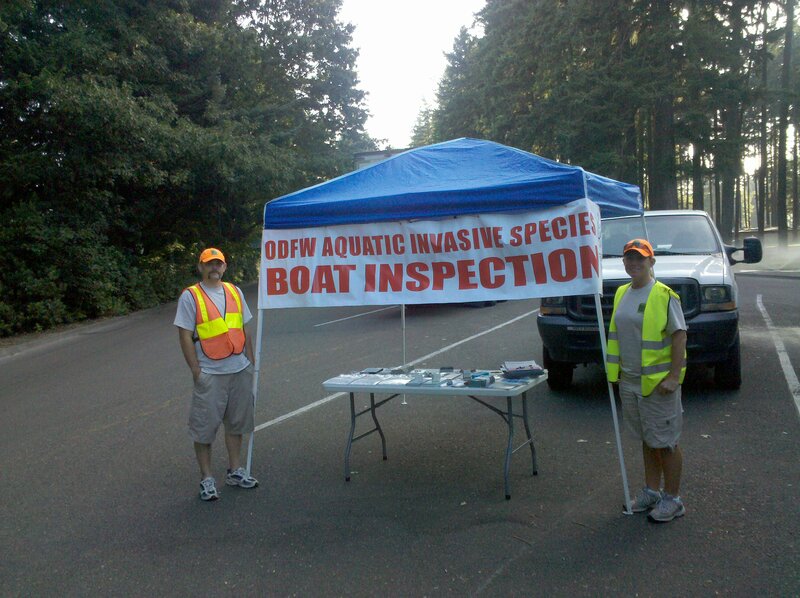 This boat inspection stop is part of Oregon’s Aquatic Invasive Species program, which kicked off the end of May. The program has four new mobile inspection teams, which will visit some of the State’s busiest boat ramps this summer to help keep aquatic invasive species out. The Aquatic Invasive Species program is jointly operated by the Oregon Department of Fish and Wildlife and the Oregon State Marine Board. Water clarity has improved at Blue Lake three years after Metro spent tens of thousands of dollars on algae-combating machines, but the devices may be abetting the spread of troublesome weeds. “What we’ve found is that the pH has been a little bit worse, the water clarity has been a little bit better, and the toxic-algae problem has been about the same,” said Metro biologist Elaine Stewart. The regional government and the solar-powered devices’ manufacturer say, however, that it’s still too early to render a verdict on whether the money was well spent. 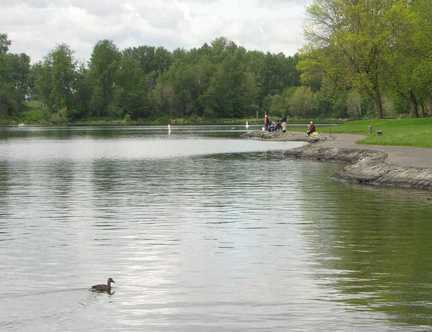 Matthew Preusch/The OregonianIn 2007, Metro and homeowners on Blue Lake invested in three SolarBee water mixers to try to combat blooms of blue-green algae at the lake east of Portland. The solar-powered machines churn the lake water to limit algae growth. California and Nevada mount a counterattack against invasive nonnative clams. California and Nevada agreed Thursday to jointly mount a counterattack against invasive species that pose an increasing threat to Lake Tahoe’s azure waters. California Secretary of Natural Resources Mike Chrisman and Nevada Gov. Jim Gibbons signed the agreement during an environmental summit that annually brings together scientists, politicians, federal land managers and conservationists to get updates on the condition of the lake and new potential sources of harm to its famed clarity. “Those of us in the political arena come from many different political points of view, but we come together when we talk about Lake Tahoe,” said Sen. Dianne Feinstein (D-Calif.). “That little line that goes down the middle of the lake between our two states is not a line that divides us. It is a line that joins us,” said Gibbons, a Republican. Although catastrophic wildfires, air pollution and erosion continue to pose threats to the lake, new research shows a major infestation of nonnative Asian clams could cause even more trouble. The dime-sized clams are believed to be linked to a major algae bloom last summer, and experts said they could help other invaders, quagga and zebra mussels, successfully establish themselves at the lake. Densities of clam beds have increased dramatically since their discovery in 2002.